One of my most popular article to date on Seeking Alpha. It’s was a top trending article for two day and it has received a lot of good comments. I’m proud of the achievement but again any article on Apple, Facebook, Google, or the cool stock of the moment will get you trending. It’s great, but it also goes against what Seeking Alpha is about, which is shining a light on companies with limited or no coverage. SA still serves that purpose and it’s great for that, but it’s still hard to get attention sometimes on little unknown companies. Apple has so many analysts so I’m not sure why people bother writing articles about it on SA. There are so many companies that are bargains but nobody has never heard of them. Anyway here’s a preview of my article on Apple’s IPO. The full article is free on SA. I suggest you go read the comments. There’s a lot of good stuff there. It’s almost like a trip down memory lane for so many people. Apple was a 205-bagger from 1990 to today (3-17-2016), without calculating dividends. But you needed an 80% loss twice in order to get it. Not your classic buy and hold fairy tale. I’m a big fan of history and business. Combine both of them and you have quite a passion. While reading on what makes companies into multi-baggers, Apple Inc. (NASDAQ:AAPL) came up. I started researching old documents on Apple Inc. which eventually led to the IPO. I wanted to know, what at the time, made Apple a multi-bagger. Multi-bagger is a term popularized by Peter Lynch, author of One Up on Wall-Street and a manager at the Magellan Fundat Fidelity Investments from 1977 to 1990. Peter Lynch often uses the term “10-bagger,” which is when a stock goes up 10 times in value. I hope I’m not shocking anyone by stating the fact that Apple qualifies as a multi-bagger. Actually Apple is a multi, multi-bagger. My research led me to the Apple IPO, which was pretty interesting itself. So I decided to make an article out of it to share some of my research and findings. I might write an article on multi-bagger companies later. At today’s price of $105, Apple is a 205-bagger plus from 1990 to today, without dividends. For those who observed Apple’s share price from outside, the stock performance seemed to be an unbeatable machine. However, a closer look would reveal that it wasn’t always a fantastic engine. In 1977, Apple Computer (now known as Apple, Inc.) was a very different company and Steve Jobs was a very different entrepreneur. 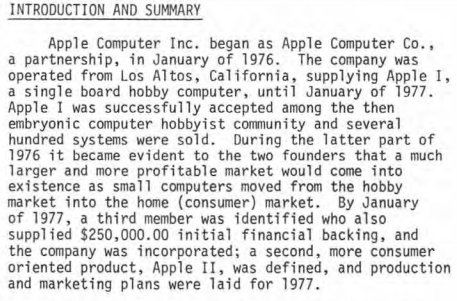 Apple had its IPO in 1980 which I review in detail below. By looking at Apple’s stock price today, around ~$105 post-split, investing in Apple at the beginning would have looked like a no-brainer. You always hear people saying that if they bought Company X when it first came out, they would have been multi-millionaires today. The real story for early Apple investors, however, wasn’t all sunshine and rainbows. This is not your classic “buy and hold” fairy tale. If you would have bought Apple at the beginning and held on to it, you would have been clinically depressed for a good part of your life, unless you get joy out of pain. I did open my article by mentioning that Apple is a multi-bagger, but you needed an 80% loss twice in order to get it. First, let’s start with the IPO then I will walk you through the performance history. *Price per share mentioned are pre-splits numbers unless mentioned otherwise. I like how the clipping above had to mention that Apple was a Californian company that makes personal computers. For part of the research, I have to thank the Computer History Museum and The New York Times archives for my research. The Computer History Museum has two special documents from Apple Computer during the early days of personal computing. The first is thePreliminary Confidential Offering Memorandum – a document supporting a private placement of funds for Apple before the IPO. The document also contains the product and marketing plan. Computer History Museum CEO John Hollar noted the plan also “goes to great lengths to explain why anyone would even want a personal computer (e.g., forecasting eight reasons “that indeed, by 1985, a household using a computer will have significant advantages over one that doesn’t”), and that every single competitor listed is no longer in the PC business.” And if you are really interested, the second document is thePreliminary Macintosh Business Plan, which is post-IPO. Apple Computer Inc., now renamed Apple Inc., had its IPO (prospectus) more than thirty-five years ago, on December 12, 1980, with 4.6 million shares priced at $22 ($0.39 a share post-split). Since then the stock has split four times, including three 2-for-1 splits (1987, 2000, 2005) and recently one 7-for-1 split (2014). That means your 100 shares would have multiplied into 5,600 shares today, or 56 times your original holding. Apple raised $101 million. Apple sold 7.4% of the company of the 54.2 million shares outstanding at the time. On that day, the Dow soared 21.59 points to 958.79, staging its biggest one-day rally since spring 1980. The Dow jumped because of a surprise half-point reduction in the prime rate by Wells Fargo to 20.5%! (Yes, you read that correctly, interest rates were extremely high back then, don’t ever forget that it could happen again). During fiscal year 1980, Apple had sales of $118 million, up from 774k in 1977. Earnings also came at $11.7 million, or EPS of $0.24, compared with $41,575 or EPS of $0.01 in 1977. Now, think of how much Apple makes every minute. In 2015, Apple had sales of $233.7 billion and $53 billion in net income. 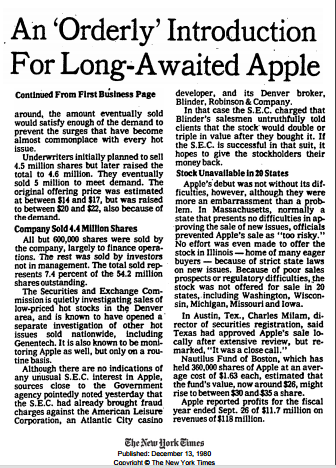 Apple had a second offering of 2.6 million shares that quickly sold out in May 1981. 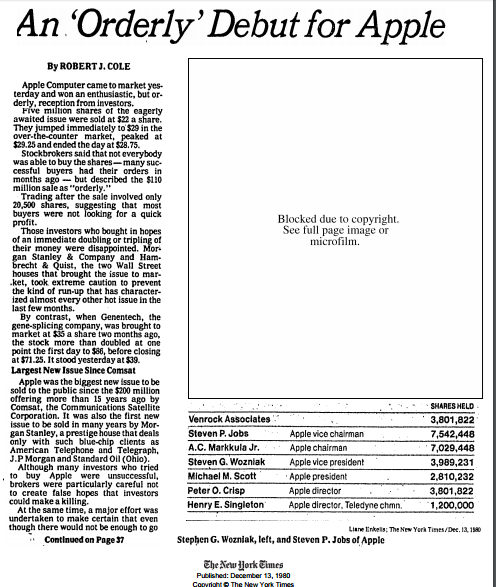 I found old news clipping below from The New York Times archives on Apple’s IPO. Source:The New York Times, December 13, 1980. First Business Page, Part 1. Source:The New York Times, December 13, 1980. Page 3 of the Business Page, Part 2. Source: The New-York Times, Business Digest, Saturday, December 13, 1980. As the article states, the IPO was a major success. The shares jumped immediately to $29, peaked at $29.25, and closed at $28.75. The offering happened to be the largest IPO in 15 years at the time since Comsat (side note: Comsat is the same company that owned the Denver Nuggets from 1989 to 2000, and bought the NHL Quebec Nordiques and moved them to Denver as the Colorado Avalanche. Comsat was acquired by Lockheed Martin Corp. (LMT)). The original offering was estimated at between $14 and $17, but due to strong demand was raised to $20 and $22. Sorry, to cut you short, the full article is on SA or they will ask me to take it down. Thanks. I found this condensed passage below very interesting. I think it should be read in conjunction with my latest article, My Investment Approach. It should never be forgotten that, in its most basic form, investing is always and everywhere about price and value. Price is what you pay, says the Sage of Omaha, and value is what you get. By this definition, every serious investor must be a value investor. This is not to say that investors should restrict themselves to buying companies with low valuation multiples. The business of investment is ultimately about buying stocks at a discount to intrinsic value. So how do you calculate value? Well, in theory the value received is derived from future cash flows discounted back to today at the appropriate discount rate. The trouble is that we are rather poor at making predictions, especially about the future. But that doesn’t put us off. We suffer from what Nassim Taleb calls the “epistemic arrogance” – in plain English, we think we are better at making predictions than we really are. The result is that we have a misplaced sense of confidence in our forecasts. Investors like modelling because it appears scientific (the more spreadsheet tabs, the greater the effect). Investment models, however, encourage anchoring. Most models are calibrated to produce a current value for a company within a reasonable range of the current price. Another wrinkle is the discount rates. If you don’t accept that historical volatility (beta) is a good measure of risk (which we do not), then it’s not clear how to calculate the appropriate discount rate. At Marathon, we believe that detailed forecasting adds little value. One common response to the difficulty of forecasting is to turn to simple value proxies, such as the price-to-book ratio, price-to-earnings ratio, and free cash flow yield. Many “value” investors advocate buying a basket of stocks which are cheap by these measures. There’s nothing inherently dumb about this approach. Each of the measures is a very useful indicator of potential value, but there’s a danger of oversimplification. Traditional valuation measures say nothing about the specific context of an investment – for instance, a company’s business model, its industry structure, and management’s ability to allocate capital – which determines future cash flows. Quantitative valuation measures also tend to encourage a narrow categorization of investment styles. Take for example the S&P US Style Indices. Value stocks are defined by their ratios of price-to-book, price-to-earnings, and price-to-sales. The growth index, on the other hand, is defined by the three-year change in earnings per share, three-year sales per share growth rate, and 12-month price momentum. While some of these factors are powerful, they are too crude to be the sole framework for assessing value. A brief overview of my investment process. This is a partial publication and the full article is available free of charge on Seeking Alpha. Below is a rare 1991 Barron’s interview (pdf) with Seth Klarman from the Baupost Group. He’s also the author of the out of print Margin of Safety, which a copy sells for over $1,000. Credits to “The Odd Lot” from oddlotinvest.wordpress.com/. For some reason the website is no longer available. What are the core differences between Republicans and Democrats? Great post by Tyler Cowen from the blog Marginal Revolution. I decided to repost the whole thing. We know some of the core differences because Democrats and Republicans, but in this post Tyler takes it a step further. Also Cowen runs a very interesting blog, I recommended that you visit it once in a while. My view is not so far from that, but I would put it a little differently and then push harder on some other dimensions of the distinction (btw Brad DeLong comments). The Republican Party is held together by the core premise that the status of some traditionally important groups be supported and indeed extended. That would include “white male producers,” but not only. You could add soldiers, Christians (many but not all kinds), married mothers, gun owners, and other groups to that list. Democrats are a looser coalition of interest groups. They agree less on exactly which groups should rise in status, or why, but they share a skepticism about the Republican program for status allocation, leading many Democrats to dislike the Republicans themselves and to feel superior to them. In any case, that underlying diversity does mean fewer litmus tests and potentially a much broader political base, as we observe in higher turnout Presidential elections, which Democrats are more likely to win these days. That also means more room for intellectual flexibility, although in some historical eras this operates as a negative. Right off the bat, this distinction between the two parties puts most blacks, single women, and most but not all Hispanics in the Democratic camp. Not-yet-assimilated immigrants have a hard time going Republican, even though a lot of high-achieving Asians might seem like natural conservatives. No matter how much Republicans talk about broadening their message, the core point is still “we want to raise the status of groups which you don’t belong to!” That’s a tough sell, and furthermore the Republicans can fall all too readily into the roles of being oppressors, or at least talking like oppressors. Republicans, who are focused on the status of some core groups at the exclusion of others, are more likely to lack empathy. Democrats, who oppose some of the previously existing status relations, and who deeply oppose the Republican ideology, are more likely to exhibit neuroticism. It is easy for Republicans to see the higher neuroticism of Democrats, and easier for Democrats to see the lesser empathy of Republicans. It is harder for each side to see its own flaws, or to see how the other side recognizes its flaws so accurately. Academics are one of the interest groups courted by Democrats. Academics want to appear high status and reasonable, and Democrats offer academics some of those features in the affiliation, including the option to feel they are better than Republicans. So on issues such as evolution vs. creationism (but not only), Democrats truly are more reasonable and more scientific. Academics consume those status goods, plus the academics already had some natural tendencies toward neuroticism. Academics shouldn’t feel too good about this bargain. They are being “used” as all party interest groups are, and how much reasonableness they can consume in the Democratic coalition will ebb and flow with objective conditions. In the 1970s and 1980s, for instance, it was common for Democrats to be more delusional than Republicans, and those days may someday return, though not this year. Next, we must move beyond the federal level to understand the two parties, and that is also a good litmus test for whether a discussion of the two parties is probing as opposed to self-comforting. At the state and local level, the governments controlled by Republicans tend to be better run, sometimes much better run, than those controlled by the Democrats (oops). And a big piece of how American people actually experience government comes at the state and local level. This superior performance stems from at least two factors. First, Republican delusions often matter less at the state and local level, and furthermore what the core Republican status groups want from state and local government is actually pretty conducive to decent outcomes. The Democrats in contrast keep on doling out favors and goodies to their multitude of interest groups, and that often harms outcomes. The Democrats find it harder to “get tough,” even when that is what is called for, and they have less of a values program to cohere around, for better or worse. Second, the states with a lot of Democrats are probably on average harder to govern well (with some notable Southern exceptions). That may excuse the quality of Democratic leadership to some degree, but it is not an entirely favorable truth for the broader Democratic ethos. Republicans, of course, recognize this reality. Even a lot of independent voters realize they might prefer local Republican governance, and so in the current equilibrium a strong majority of governors, state legislatures, and the like are Republican. If you wish to try to understand Republicans, think of them as seeing a bunch of states, full of Republicans, and ruled by Republicans, and functioning pretty well. (Go visit Utah!) They think the rest of America should be much more like those places. They also find that core intuition stronger than the potential list of views where Democrats are more reasonable or more correct, and that is why they are not much budged by the intellectual Democratic commentary. Too often the Democrats cannot readily fathom this. At some level the Republicans might know the Democrats have valid substantive points, but they sooner think “Let’s first put status relations in line, then our debates might get somewhere. In the meantime, I’m not going to cotton well to a debate designed to lower the status of the really important groups and their values.” And so the dialogue doesn’t get very far. Again, both the Democrats and the Republicans have their ready made, mostly true, and repeatedly self-confirming stories about the defects of the other. They need only read the news to feel better about themselves, and the academic contingent of the Democrats is better at this than are most ordinary citizens. There is thus a rather large cottage industry of intellectuals interpreting and channeling these stories to Democratic voters and sympathizers. On the right, you will find an equally large cottage industry, sometimes reeking of intolerance or at least imperfect tolerance, peddling mostly true stories about the failures of Democratic governance, absurd political correctness, tribal loyalties, and so on. That industry has a smaller role for the intellectuals and a larger role for preachers and talk radio. It is easier for intelligent foreigners to buy more heavily into the Democratic stories. They feel more comfortable with the associated status relations, and furthermore foreigners are less likely to be connected to American state and local government, so they don’t have much sense of how the Republicans actually are more sensible in many circumstances. It would be wrong to conclude that the two parties both ought to be despised. This is human life, and it is also politics, and politics cannot be avoided. These are what motivations look like. Overall these motivations have helped create and support a lot of wonderful lives and a lot of what is noble in the human spirit. We should honor that side of American life, while being truly and yet critically patriotic. That said, I see no reason to fall for any of these narratives. The goal is to stand above these biases as much as possible, and communicate some kind of higher synthesis, in the hope of making it all a bit better. This year, I’m just hoping it doesn’t get too much worse. In the last few years I have seen some nascent signs that Democrats are becoming less reasonable at the national level, for instance their embrace of the $15 national minimum wage. I also am seeing signs that the Republicans are becoming less fit to govern at the local level, probably because national-level ideology is shaping too many smaller scale, ostensibly pragmatic decisions. The Trump fixation also could end up hurting the quality of Republican state and local government. So this portrait could end up changing fairly rapidly and maybe not for the better. My latest article published on Seeking Alpha. It’s on the iconic and global brand Moleskine. This is the same company that is all the rage right now among artists and professionals. It’s also makes a great gift. Seeking Alpha has the rights to the article. For the full article you have to visit their site. Moleskine is an iconic and global brand. The Moleskine brand has developed a cult-like following. Over the years Moleskine has delivered continued double digit revenue and EBITDA growth. Solid balance sheet. Almost net cash (4.1m euros in debt). The notebooks are popular amongst professionals, artists, hipsters, and collectors. Slump in the share price is not justified. Moleskine is consistently matching or beating their targets. The market is not noticing. Moleskine is primarily traded on the Milan stock exchange Borsa Italiana under the ticker MSK:IM, where there’s plenty of volume. I will be referring to the Italian symbol for the article. Note: Dollar amounts are in Euro € unless mentioned otherwise. EUR-USD 1.1025. Price of 1 EURO in USD as of February 25, 2016. Moleskine SpA (OTCPK:MOSKY) is an Italian manufacturer of luxury notebooks and other stationery items such as agendas, journals, bags and cases. The company might have an Italian headquarters, but its business is global. You would actually think it’s American with its Star Wars and Batman notebooks. Moleskine suffers from a lack of coverage. Except for one article in 2015 and (one in) 2013, there is no coverage on Seeking Alpha. Part of this article is to demonstrate this opportunity, and I sort of hope the article can spark further discussion on the investment merits of Moleskine. Throughout the article I will refer to journals, diaries, planners, agendas as “notebooks” for simplicity’s sake. Moleskine’s business might be exploding but its stock is not. The stock has been trading on the Milan Stock Exchange since 2013. As the graph below demonstrates, the stock has been slumping since the IPO. Source: Google Finance. Stock is down 31.7% since the IPO in 2013. In this article I will provide my investment case for Moleskine. With a conservative approach, I believe the stock has a 30% to 40% upside from where it’s trading today. There are several catalysts that could turn the slump in the stock price around such as: continued growth at a double digit rate, more market coverage by analysts and the media that enhances the stock’s visibility, a share buyback program to take advantage of the discounted price, a take-over offer, and the market realization of the full value of Moleskine’s assets and brand. The current slump in the share price is unwarranted. Moleskine is consistently matching or beating their targets but the market is not noticing. You wouldn’t expect a paper notebook company to be successful in a digital world. Moleskine is not an isolated case of “old world” technology making a comeback, or simply refusing to disappear. Moleskine’s success is part of a movement that some have labelled the “revenge of the analog”, especially among the young people. The movement, where certain technologies and processes that have been rendered “obsolete” suddenly show new life and growth, even as the world becomes increasingly driven by digital technology. You can see this renaissance with business cards and the return of vinyl records. For the full article and valuation, it’s available on Seeking Alpha since they have the rights to the article. Thank you for reading.